The 150th birthday of Elizabeth von Arnim fell on 31st August 2016 and the International Society set up in her name in December 2015 was keen to mark the occasion. A party, kindly hosted by Jennifer Walker and her husband, George, was arranged for 4th September at their home in Suffolk. Thankfully, the weather was kind as von Arnim scholars from Britain, Ireland and France gathered in the garden with von Arnim enthusiasts and also six members of Elizabeth’s family from New Zealand, the U.S and the U.K., to chat and exchange thoughts about her life and writing. There were several surprises as the afternoon progressed. 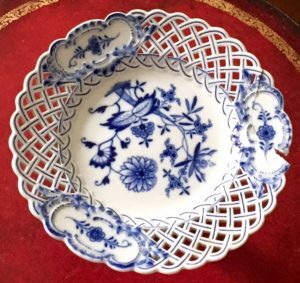 One family member had brought along a beautiful Meissen plate that belonged to Elizabeth. This is thought to originate from Nassenheide, the house and garden that feature in von Arnim’s first novel, Elizabeth and Her German Garden (1898). It was a rare pleasure to be able to see the piece at close quarters. 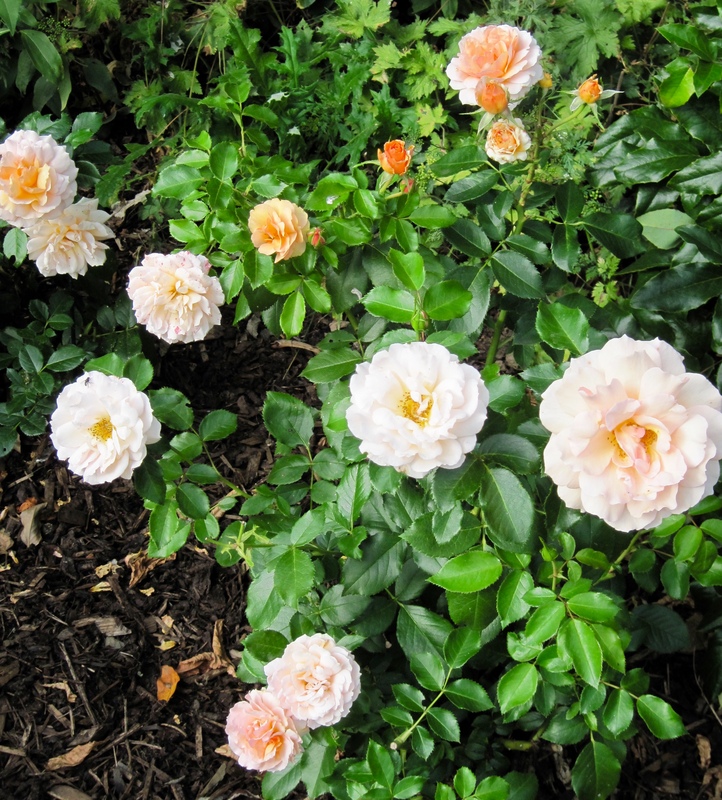 The backdrop for the afternoon celebration was especially appropriate, too, since the garden held several glorious ‘Elizabeth’ roses in full, and vibrant, flower. It’s fair to say most of us who had planted these roses in our own gardens, to commemorate the 150th anniversary, felt rather inadequate when presented with these thriving specimens, but we all committed to do our best for next year’s crop. Roses are available from Dickson Roses until Spring 2017. We were delighted that the family had joined us to help celebrate. Along with our hosts and the society’s steering group, the family were all warmly thanked for their support of the Elizabeth von Arnim Society in its first year, and for their help with the work of individual scholars. 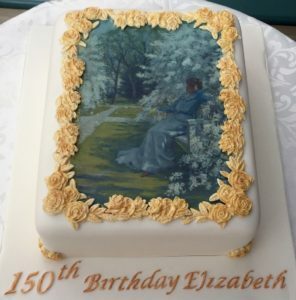 Ann Hardham (the Literary Executor of the von Arnim Estate) and her husband, Phillip, had flown over from California to join us and, after a rousing chorus of ‘Happy Birthday, Elizabeth’, Ann blew out the candles on the cake which had a lovely image from the 1906 illustrated edition of Elizabeth and Her German Garden emblazoned on its top. It was a particular pleasure to wander around the house and see a display of Elizabeth-related rare books, documents, photographs and also a detailed family tree; this helped create what can only be described as a distinctly ‘Arnimesque’ atmosphere. When Jennifer read from the comic opening of The Jasmine Farm (1934) where the narrator outlines the perils of serving gooseberry tart, it seemed the day had reached a climax, until Diana Hirst unexpectedly presented us with her home-made, highly digestible (!) and delicious gooseberry tarts to round off the afternoon. The birthday celebration was fun and a great success. It was a pleasure to meet so many people who share an enthusiasm for von Arnim’s work. The Society very much hope others will join as we now look forward to future events and celebrations, and particularly to next year’s joint conference with the Katherine Mansfield Society at the Huntington Library, California. We hope to see you there in July 2017! Thank you so much for sharing your blog post, Buch and Sofa! http://buchundsofa.de/liebe-elizabeth-von-arnim.